"With each step, she oscillated between every mantle that had been thrust upon her over the past year: the library girl, the sorcerer, the soldier, the agent of death." Vhalla Yarl has made it to the warfront in the North. Forged by blood and fire, she has steeled her heart for the final battle of the Solaris Empire’s conquest. The choices before Vhalla are no longer servitude or freedom, they are servitude or death. The stakes have never been higher as the Emperor maintains his iron grip on her fate, holding everything Vhalla still has left to lose in the balance." Honestly out of 10, if I could I would give this book 100, but that is however not possible so I give this book a 10 out of 10 rating. My initial reaction while beginning the third book in the Air Awakens series is best described using the GIF below. Before I even began my journey back into the world Elise Kova created, all and I mean ALL the feels from Fire Falling came back. I was extremely worried due to some tragedy regarding the way Fire Falling ended, however problems were solved. Elise knows how to set up a story and have the whole plot follow that. This has been set up and executed throughout the three book that are released so far in this series. The characters were yet again brilliant and the story from the moment I picked up the book pleased. Let's start off this review by mentioning one of the things Elise did brilliantly and has done brilliantly throughout all the books in her Air Awakens series. This would be the actual story telling and plot planning. Since reading the first book and now just finishing the third, there are all these little details and hints that end up becoming part of a greater idea. That I didn't quite fully appreciate and acknowledge until Earth's End. Some were in ACTUAL plain sight, others required digging a little deeper. Nonetheless it was there. Another unique aspect about this series is that it is a five book series. The problem with me, is that I usual begin losing interest after the third book, so I can never really commit to a full series, UNLESS it's worth committing too. Well I am having no such problem with the Air Awakens series. I am beyond the point of hooked, if that's even possible. Elise's writing style in unique and captivating from start till finish and everything after. Another thing that sets this series apart from others is the development. I think every character has shown growth, strength, and change. None of them are the way they were when the series first started. That's what also makes this series so unique. Each character has so much depth and detail that I as a reader feel as though I have a connection with each. Of course there will always be those characters that have a special place in my heart such as Vhalla, Aldrik, Elecia, Fritz, Daniel, Baldair, AND JAX! Let's begin with Vhalla Yarl. Vhal is the main protagonist of this series. In each book she has grown and developed in ways I could never have fathomed. She has been a libraries apprentice, a sorcerer, and a weapon/soldier. She has shown so many strengths throughout not only this novel but the previous two as well. She's not only a likable character, but also a character that many can connect with. She's smart and she's got this edge to her that I very much enjoy. Vhalla also knows how to surprise me as a reader. She is portrayed amazingly, and written so well. My next favourite character would be my secret boyfriend Aldrik... whoops I guess it's not a secret anymore. Aldrik appears to have this cold to the touch exterior and interior, but rather he has this sort of warmth to him, and no it's not just because his affinity is fire. I think we see a lot of change from Aldrik. The lengths he is willing to go to please Vhalla, were amazing. His growth was extraordinary though, because we were use to such a cold prince (yes he had his moments of sweetness but) and then in Earth's End we see a whole new side to him. I think I died every time he called Vhalla his lady, his love. Another thing I enjoyed about him was all his scheming and planning. Aldrik is quite the riveting crown prince, and I will forever thank Elise for bringing him to paper for all to enjoy. The man titled his head. "You show up as if you materialize from wind itself, to save the life of the crown prince whom you jumped off the side of the pass in an attempt to save. You're unassuming, you're filthy, and you're soaked in what I can only presume to be the blood of our enemies." A grin slowly spreads across Jax's face, like that of a rabid beast. "Who said anything about being disappointed?" Everything about Jax's character was just so brilliantly put together. I love him so much that I even got to do an exclusive interview with him (Click HERE if you wish to see more of Jax). Now to cover the ending of the story. I won't reveal to much of what actually happened, but I will say this. Parts of me felt as though in someway it needed to happen. Vhalla and Aldrik's relationship intensified quite a bit in this book, and it was like there was no breather AND let's see, what does fire need in order to continue, oxygen (sorry that was really bad). Anyway, yes it left me feeling a little empty inside, however I totally understood why it needed to occur to allow the story to grow even more. So this ending definitely didn't make me hate Elise as an author, I mean I didn't even hate Elise after the ending of Fire Falling (now that was a crushing ending). That just means Elise is such a brilliant author that the way she crafts things. For every outcome there is backing as to why something needed to happen, and that backing is always there. 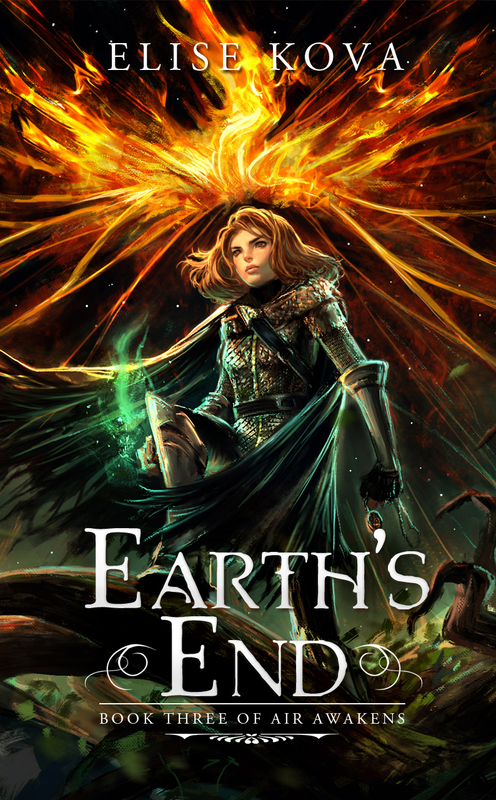 In conclusion, Earth's End was amazing. As the Air Awakens story grows so do us as readers, adapting to the changes and growth of characters. I am curious to see where Water Wrath's takes us and how I will handle some separation issues. Overall Earth's End was brilliant and I felt like the GIF below. 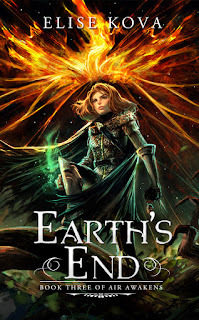 I highly recommend this book to those who have read the earlier books in the series, if not then I highly suggest going and reading this YA fantasy magic series. Elise's planning of this series is one of my favorite things! Each little piece is placed with such purpose and it has a huge impact on the overall story. Even though we don't have to wait a year for each book, months begin moving like molasses. I'm so impatient when it comes to books. Bannerizer made it easy for you to promote ClickBank products by banners, simply go to Bannerizer, and get the banner codes for your selected ClickBank products or use the Universal ClickBank Banner Rotator to promote all of the available ClickBank products. The Affiliate is on SALE!! !